DENBY DALE is a mixed media artist residing in Asheville, NC. She is known for her adaptability within several artistic mediums including sculptural encaustic painting, abstract drawing, and small format assemblages. The abstract approach to all of her work is consistently informed by the embrace of color and mark making movement, juxtaposed with form driven minimalism. Born in Washington D.C and spending the balance of her young adult life in Massachusetts, Dale received a BA in English with a minor in Studio Art from Connecticut College in New London, Connecticut. She then spent over 15 years managing multiple fine art galleries in southern Massachusetts. She immersed herself in the representation of a number of accomplished artists across various genres, including contemporary painting from China and stone sculpture from East Africa, where she also traveled to assist in selecting new works for exhibition. While managing and operating galleries, and always happily tethered to an art community, Ms. Dale continued to develop her own art practice, and her work can be found in several private and business collections. She consistently exhibited works at several New England galleries, including Scargo Pottery & Art Gallery in Dennis, MA, The Provincetown Art Association and Museum, & The Cultural Center of Cape Cod. She has participated in several significant group exhibitions at galleries including the Bowersock Gallery and The Schoolhouse Gallery, both also located in the renowned historic art community of Provincetown, MA. In 2009 she was chosen to participate in the international encaustic exhibit Encaustic Works 2009, 7th International Biennial. In addition, Dale has exhibited and sold assemblage pieces at the DeCordova Museum & Sculpture Garden museum shop in Lincoln, MA, ID in Provincetown, MA, and Origami Ink in Asheville, NC. She was recently the selected cover artist and interviewee for The Laurel of Asheville, a local arts and culture magazine. Currently, Dale’s encaustic and painting work is represented by Contemporaneo Asheville Gallery, in Asheville, NC. 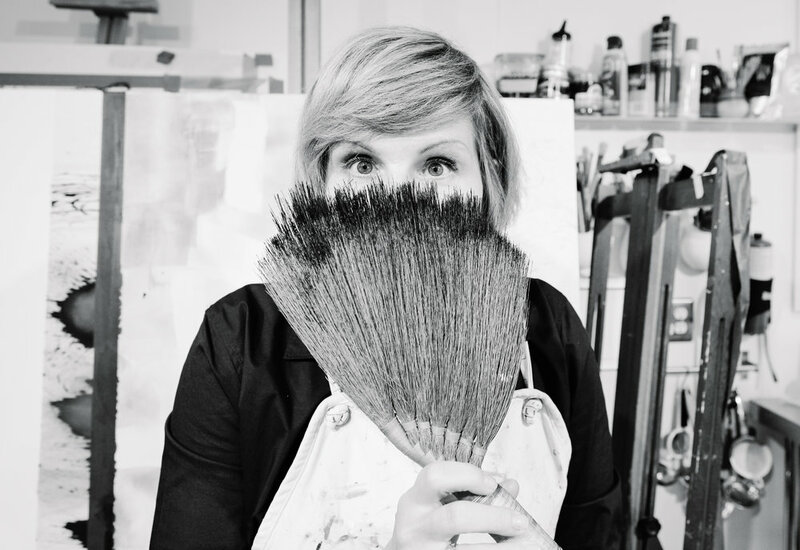 She has recently launched a series of mixed media teaching workshops at the gallery, and looks forward to welcoming students for instruction in her own studio in the near future. Dale’s assemblage work is regularly accepted into numerous fine art festivals across the United States, which she selectively attends throughout the year. I am a mixed media artist working primarily in encaustic and cold wax and oil, with ample portions of other media mixed in as needed. I find great satisfaction in the marriage of seemingly ill suited materials, a nod to my first love of collage and assemblage. Although the majority of my work is technically two dimensional, much of my work features three dimensional sculptural elements that taunt the viewer with the suggestion of another layer, plane or surface of perspective – obscured or exposed- exploring the notion that not all is revealed or understood upon first blush or experience. Why this toggling between movement filled colorful abstract drawings, pared down geometric studies in wax, and tiny format assemblages? For me, these notions reflect an everyday struggle – the perennial too much/not enough paradigm our current society jockeys within, and with which I grapple myself. Which is it? Does it depend on the day, the mood, the company you keep? Is there great solace in austerity, or presumed safety in indulgence? I explore these concepts by building up or stripping down layers of tension and release with color, line, form and pattern.